Smart Insulin Update: Is It Really Smart Yet? Here’s a great review article from the JDRF-Helmsley Charitable Trust Glucose Responsive Insulin (GRI) workshop last month, as reported by Emily Regier, Alexander Wolf and Kelly Close in diaTribe.org, 5/20/2016. The theory behind “Smart Insulin”: a next-generation insulin that works automatically in response to blood glucose: the higher the blood sugar, the more insulin is released or activated, and the lower the blood sugar, the less insulin is released or activated. The reality, as the leaders emphasized at this meeting, is that glucose responsive insulin (GRI) is still in its infancy, and development will likely proceed in steps: the first generation of these drugs may offer some, but not all, of the anticipated benefits. Definitely something to watch but don’t hold your breath! Maybe there’ll be a cure before there is smart insulin?! 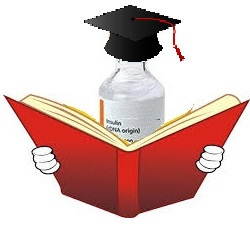 Read the entire review: Getting to Glucose Responsive Insulin – How “Smart” Will It Be? Interesting idea. I hope the idea competes with the Artifical Pancreas. Good competition is a good thing. Thanks Rick … look forward to meeting you at DHF MasterLab!